Dual shower heads can be very convenient, but their design often leaves much to be desired. It took me a while to narrow them down to a bundle I liked, but I think you’ll be happy with the selection. If you just want to know which one I think is best, let me save you some time. My favorite design, and sadly unique to this line of Delta dual units. The Delta In2ition only gets one thing wrong: the name. Boo, I say. Other than that, it’s pretty much perfect. It has five unique settings: full spray, massage (doubles as a jet, it’s a high speed massage), a slow massage, the pause setting I always look for as a plus, and a combo of the full spray and massage options. 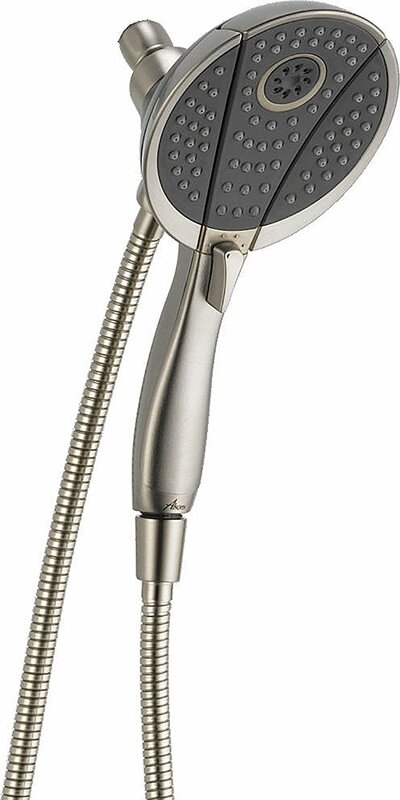 Admittedly, a “champagne” setting would be NICE (that aerates the water making large droplets) but it’s the only major setting I miss from this shower head and not one I consider a necessity. It is constructed of stainless steel with a nice bronze finish, and most importantly: nothing is in the way. The two heads are magnetically attached to each other and the handheld portion can be snapped or unsnapped from the mount at any time, leaving the primary mounted spray running or off as needed. While it is admittedly a bit expensive (ranging between a little under $250 to just under $300 depending on the seller), it’s well worth the price for the quality, and I don’t feel like it’s an unfair asking price by any means. The second of three In2itions I want to showcase. While worse in terms of settings than its big brother above, this is still an excellent dual units and may have a slight leg up in terms of design. The main difference in settings is that it lacks the “slow massage” setting of the five spray, being limited to the full body, fast massage, combination of the above, and pause. Not a huge downgrade, but still one. The design though, is arguably better. Rather than being a hemisphere with a round handheld inside, this is three interlocking wedges, meaning when you take the center out you have a wider spray from the fixed portion, and a broader spray available for cleaning or rinsing yourself with the handheld. Given this one is a bit cheaper (nearly $50 less than our winner) that may be a potential draw that makes it appeal to you more, and I wouldn’t blame you. One last In2ition, this one a kind of weird design. This one has the same settings as the wedge shaped one: full body spray, massage, a combination of the two, and pause. It gets great reviews from people in a stand alone shower (those showers that are basically a closet with glass windows and a shower, and only room for one person). For everyone else, it’s a bit iffier. The spray is very wide on this one (as you can see, there are only nine very large spray holes) which makes it perfect for those closet-like stand alone showers, since the water will bounce off the walls and drench you from multiple directions (usually a direct hit from the center and misting from the sides) which is very nice. In a larger shower, however, the sprays will be less comprehensive and far less comfortable than either of the other two. Basically: if you have a standalone shower this is the best. If you don’t, give it a pass, especially since its price is in between the one above and our winner, making it a bit expensive for a meh shower in larger or wider showers. 4. AquaStar Elite 3-in-1 High-Pressure 48-mode 7"
A good “faux rain” combo product. The primary face is a bit larger than normal (7.5 inches) making this a good rainfall-esque model while still offering the advantages of this model. 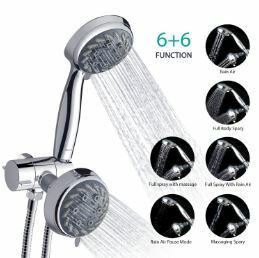 The 6 settings are nice, it coming with a power rain, mist (one of the better ones for a dual shower head since unlike normal it’s not your only water flow), pulsating massage, pause, and combinations of the above across both faces. 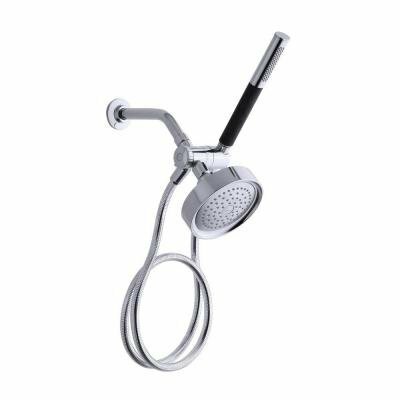 Stainless steel construction and touch clean nozzles with a chrome finish round out this pretty solid all around entry, and the price (between $50 and $70) is nothing to complain about either considering what you’re getting. A great design, but low on settings. The construction and design of this one are great. Plastic, but strong plastic, with an ergonomic grip on the handheld portion. The way the handheld is small and unobtrusive hits all the right spots for me to like it, while not being useless. I’ve used and reviewed that particular handheld before (sans combo with the fixed portion) and it packs more of a punch than it looks. The issue here mainly comes from a lack of options. Both basically have two settings: normal and jet. That’s all. For the asking price, this seems a bit lackluster. Under $130 is a bit of a steep price to pay for what you get. The main thing dragging it down is the fixed portion. The handheld is one of Kohler’s best (ad makes up about ¾ of that price on its own if bought separately), but what it’s combined with is as bare bones as it gets for a fixed unit, which is why it sits a bit lower on this list. Pretty good, but the design is frustrating. I want to like this one. Objectively it’s pretty good. Nice chrome finish, stainless steel faces and hose, five settings (though two are rain and one is pause) that combine very well with each other across the two faces, and it’s just all around good in most regards. But…the design bothers me. It’s the exact design I hate in dual model the most. I get claustrophobic just looking at it, it’s just so bulky with that big “knuckle” in the middle arranged directly beside the fixed unit. Other than that it’s great, and the price is nice too (under $60), but I can’t quite get over the inelegant design. Has a great start, but fails to stick the landing. At first glance, the design here is better than the above. It builds tall rather than wide and out from the wall, so it feels like it takes up less real estate than the above (even though it’s objectively way larger). 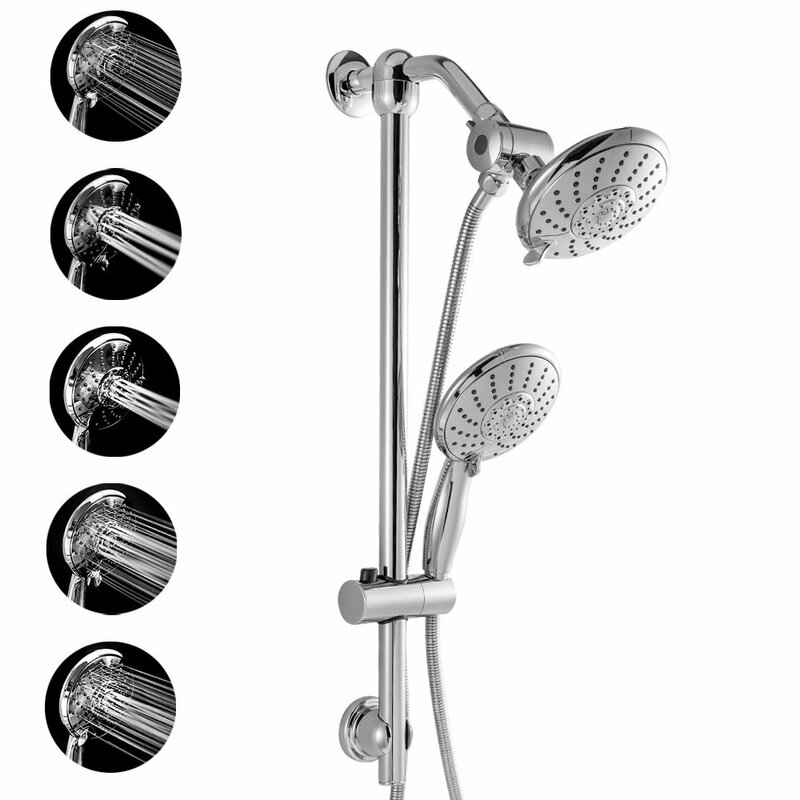 The construction is pretty good, made of stainless steel, and its six settings (spray, massage, and “bubbles” with aerated, large droplets, plus combinations of any of the above) are pretty great for a dual or combo shower head (the bubble or champagne setting especially). Even the price is good, at under $70. My main issue: the long shaft that falls from the fixed part and holds the handheld is held to the wall by a suction cup. I hate suction cups, they never work out as planned, especially in a shower. As far as I’m concerned, this is a major design flaw in an otherwise great product, and why it falls further down this list than it otherwise might have. Very similar to the Lordear. 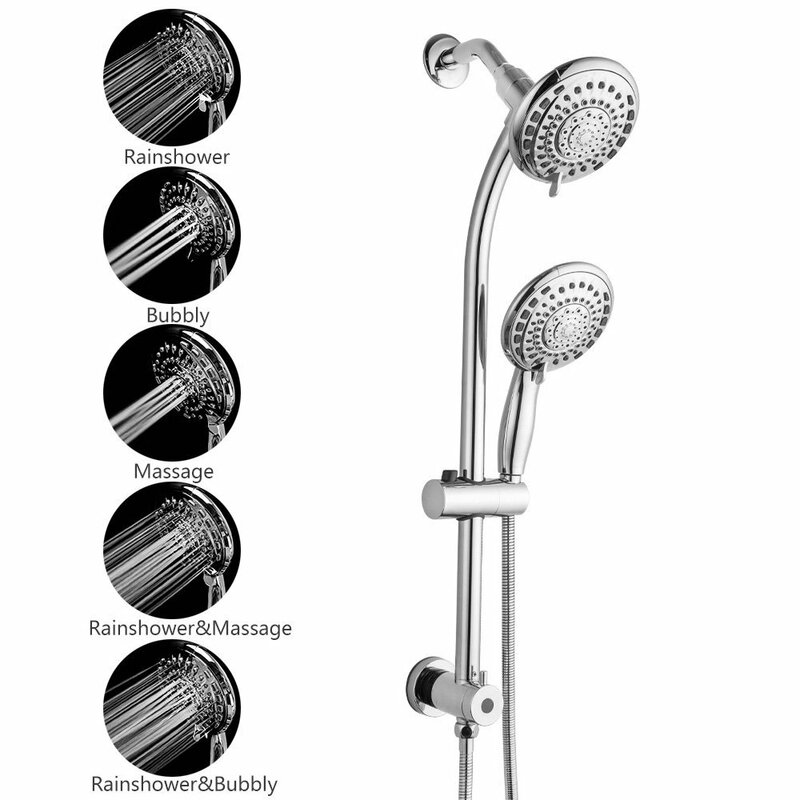 Same settings (spray, bubbles, massage, and a mix), with a stainless steel hose and ABS plastic face (chrome finish, as standard), and “build tall, not thick” design. Unfortunately, it also has the same design flaw: the suction cup. On the bright side it’s slightly cheaper than the Lordear (though pretty negligibly), but it’s also just a little bit less well designed (I like how the Lordear has the top unit but out a bit more for a faux rainfall feel), and so earns this lower slot. A bit less quality and a lot less style than anything else on the list, but it’s still pretty darn good, being little over half the price of our next cheapest option. It comes with three “true” settings: massage, full body, and champagne (or bubbles, if you prefer. “AIR spray” is their company specific term) plus pause, which is always nice to see. Not my first choice, but great if you’re on a budget, even if the design is a bit…awkward for my tastes. The Delta In2ition family steals the show here, but that doesn’t mean I would hesitate to recommend any of these if someone asked me for an off the cuff recommendation. 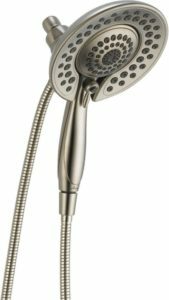 Any and all of these dual shower heads will serve your purposes, the main determiner is your budget, whether you can afford to spend $40, $70, $250 or what have you on a shower head (well, two). In general here the higher price means higher quality, but any of these will do in a pinch and I doubt you’ll have buyer’s remorse going with any of the mentioned brands. How Do I Find The Perfect One? Three main things you should keep in mind on your search for the best dual shower head are : the materials, your budget, settings and function, and the design. This last one is of course the most important (and where many shower heads fail). Depending on how high end the product you’re looking at, it should be made of either stainless steel or high grade plastic. Both are good materials, and both are easy to clean and won’t rust or corrode. The main difference is longevity: even high grade plastic will eventually crack, warp, or stretch a little. Stainless steel takes much longer to do so and can take much more abuse from its owner. Steel is also harder to scratch, which is perfect for the (admittedly very rare) unit that doesn’t have a finish of some kind (usually chrome, though some products come in a variety of finishes to choose from). 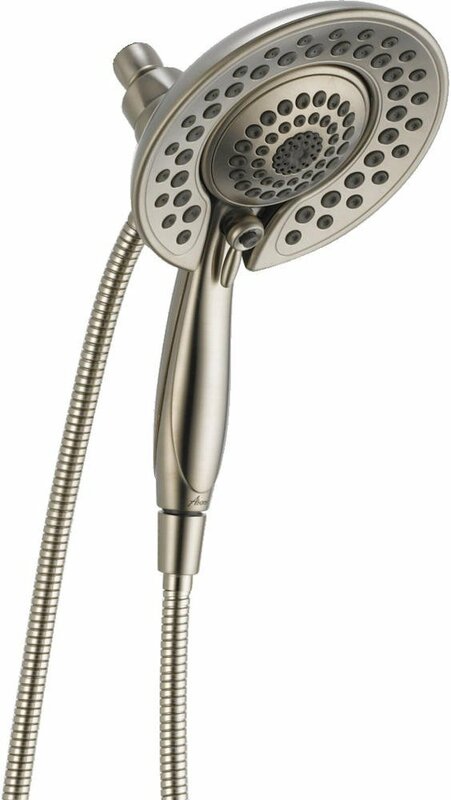 Combo shower heads tend to be more expensive than other models, for a very obvious reason: they’re two in one. 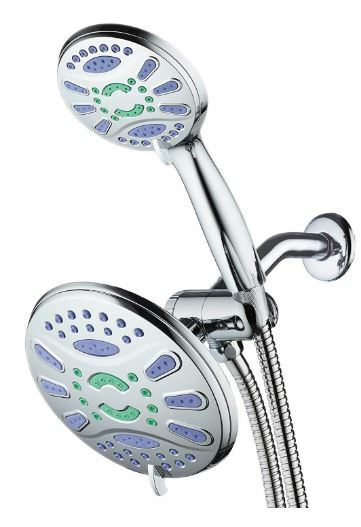 At the lowest end, a combo will cost you double what a similar quality single shower head or handheld alone will cost you. This gives us a price range of roughly $50 to $300, which can give a lot of people sticker shock if they don’t keep in mind that they need to mentally slash that price in half; you’re essentially paying for two products at the same time. Like any shower head, you’re looking for at least three primary settings: a full body spray, a jet spray, and a massage function. More functions are, of course, desirable. Particularly a pause function is very nice, and one of my favorites to look for. 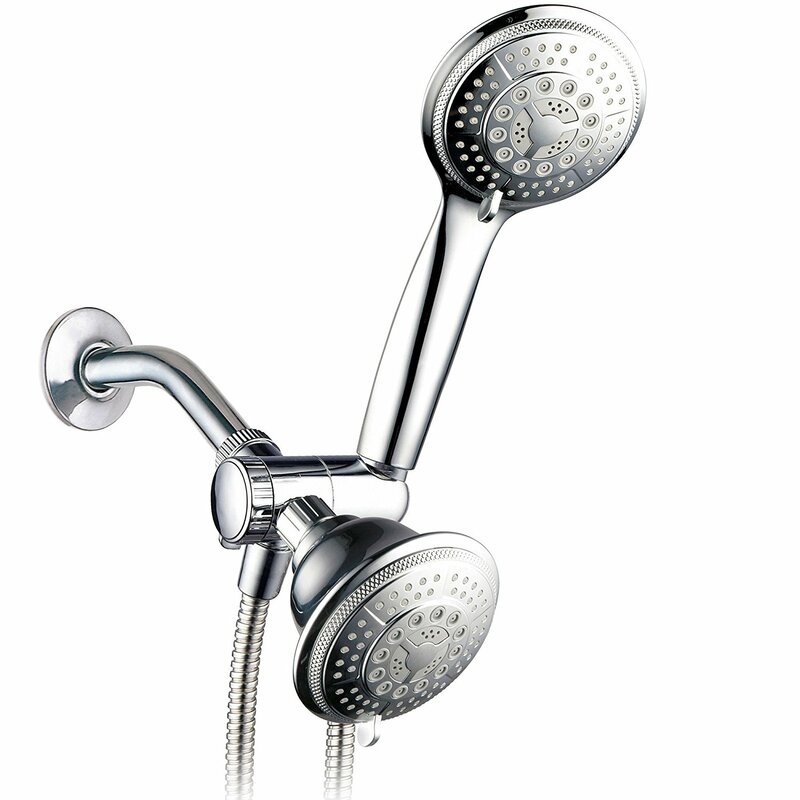 Additionally, a combo shower head needs to work with its two shower heads in tandem, being able to spray from one, the other, or both in any combination of settings across each face. This is a bit of a subjective one, but I feel the better a dual shower head is at keeping its two pieces away from each other and out of the way, the better it is. Most dual units fail at this, the two heads feeling at odds or in the way of one another. That’s part of the reason my top three are very similar options from the same brand, though their general quality in everything else is the major contributor tat keeps them at the top rather than scattered around the list.